In the first major hemispheric action against anti-globalization action since the 1999 Seattle WTO protest, at least 15 people from Grand Rapids traveled to Quebec City, Canada to participate in the protest against the Free Trade Area of the Americas (FTAA) Summit. The FTAA summit was an attempt to create a trade policy, similar to NAFTA for the entire Western hemisphere. 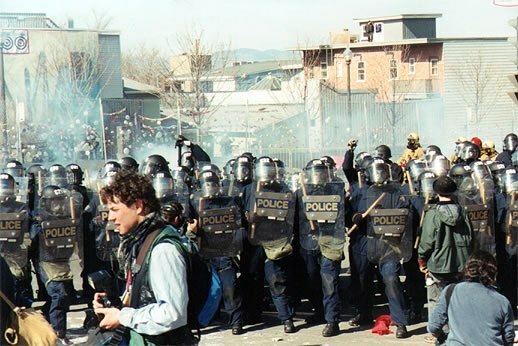 Labor groups, indigenous communities, environmentalists, anarchists and other members of civil society converged on Quebec in April of 2001 to say no to the heads of state that were meeting in the old part of Quebec City, in an area that was completed walled off to the public. 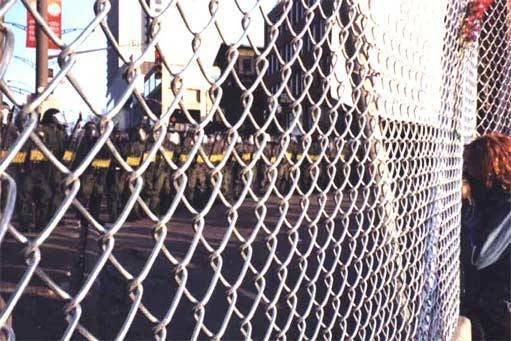 There was 10 foot fencing around the area that government officials were meeting, with several thousand cops in riot gear, using tear gas, water cannons and rubber bullets against people who were trying to shut down the Summit on the Americas. At the same time that this gathering was taking place, a parallel summit was being held by thousands of people from all over the Americas, discussing indigenous sovereignty, environmental protections, worker rights and general human rights concerns. This civil society summit had dozens of speakers with a simultaneous translation system set up so whether you spoke English, Spanish, Portuguese, French or an indigenous language, everyone could hear what was being said. 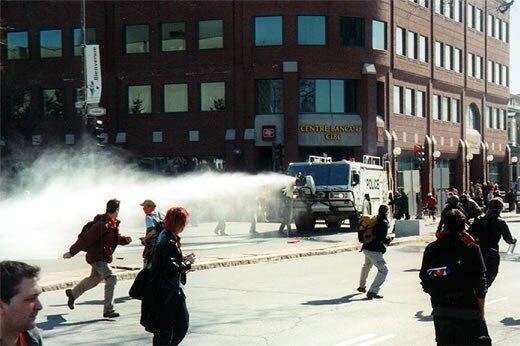 Some of the people who went to the FTAA protest in Quebec City produced this video, which was aired on GRTV just after returning from the Summit on the Americas in April of 2001. This entry was posted in Anti-Capitalism/Labor and tagged 2001 FTAA protest in Canada, Free Trade Area of the Americas protest, Grand Rapids activists at the FTAA protest, Media Mouse video on FTAA protest. Bookmark the permalink.